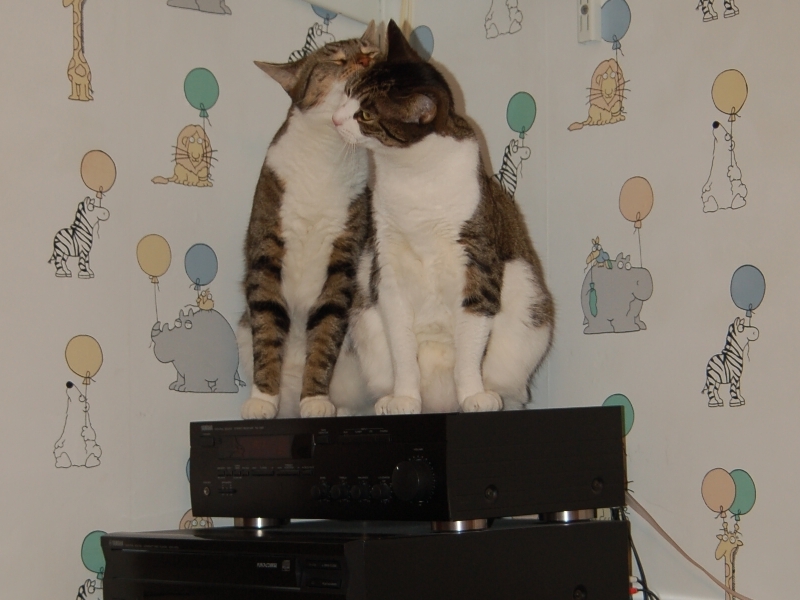 As previously noted, the boys have used my stereo for going to the high shelf in my office since they were cattens. Now they stop on it more often, sometimes for long enough that we can take a picture. But being neat felines, they want to look good for the camera. Knowing how little Whitey likes his brother power washing him, it's lucky we didn't get Cat Fu right on the Kitty Warmer. A side note: The stereo is not as small as the boys make it appear. It's actually 17 inches wide; those boys are that big. What a great picture! Ours are doing better together, but I think mutual baths are still a dream for the future.